Right now these are but tiny rumbles, but they have all the makings of a revolution. From Rio+20 to the US, and from Chuao in coastal Venezuela to Chennai, people are demanding the right to safe food and farmers the right to grow and sell the food that is ecologically most appropriate and sustainable. Wholesome food free of chemical toxins is the underlying message of the food sovereignty movement, which is just getting into its stride after it was launched in Mali five years ago in 2007. The changes as yet may not be impressive but some of what is happening augurs well for a people-centric food system. First, take a look at what’s happening in the US, the home of industrialised food. In a surprising challenge to the food production culture of the nation, towns in several states are adopting local ordinances that exempt farmers from state and federal regulations if they sell their products directly to consumers. Even more surprising is how the changes are coming about. At town hall meetings, six towns in the state of Maine approved what are termed local food and community self-governance ordinances. It is a fast spreading grassroots initiative that began in the states of Massachusetts, Vermont and California where a significant clutch of towns have all passed the so-called food sovereignty ordinances or resolutions in the past year. What do these ordinances seek? More leeway for small local producers to sell directly to the community without having to adhere to crippling investment demands to turn commercial so that consumers have more choice in the food decisions they make. Some of these towns have stood up to the bullying tactics of the US Department of Agriculture to ensure that small farmers can run their small operations and allow consumers to have their say in what they want to eat and drink. What the American ordinances are doing is to connect people to the food they eat, to enable them to demand clean, wholesome food and thus encourage the farmer to shift to toxic-free methods of cultivation. Selling and buying raw milk is a punishable offence in the US but the recently passed ordinances will allow consumers who prefer their milk unpasteurised to buy from small dairies in their vicinity. Localising food systems are a good solution: apart from putting farmers and consumers at the centre of decision-making, it also cuts down the huge carbon miles involved in the transport, storage and sale of food items. In India, fortunately people are more connected to their food since little of it is processed and packaged. But all the same there is little food sovereignty for either the grower or the consumer since neither of them is aware of the safety aspects of food and the dangerous consequences of this ignorance. As the food sovereignty movement spreads, it is relevant to go over the basic tenets of this philosophy which was enunciated in the 2007 Nyéléni declaration adopted in Sélingué, Mali. Simply put, it means the right of peoples to healthy and culturally appropriate food produced through ecologically sound and sustainable methods. It also includes the right of peoples to define their own food and agriculture systems. The latter part of this goal may be somewhat idealistic given the various constraints that farmers face from land ownership patterns to lack of infrastructure. Add to this the government’s targeted subsidies to meet the food security needs of the country and the pressure from input companies selling high-tech seeds, fertilisers and pesticides. All this takes farmers away from ecologically sound practices. But in spite of these underlying challenges, farmers are beginning to seek food sovereignty for themselves as is happening in Andhra Pradesh where the no-pesticides movement is growing in strength. So far 3.5 million farmers have turned their backs on pesticides. 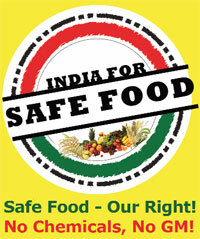 Now, a food safety movement called India for Safe Food expects to bring together farmers, consumers and the government to ensure that people have access to safe food, devoid of toxic substances. It is spearheaded by ASHA (Alliance for Sustainable & Holistic Agriculture), an informal network of hundreds of organisations and individuals across 20 states, which launched the campaign to coincide with a telling episode on the dangers of agricultural pesticides by film actor Aamir Khan in his popular Sunday morning TV show Satyamev Jayate. Indian farmers use hundreds of toxic chemicals, many of them banned in other parts of the world, in large volumes that not only render all our food, from fresh vegetables and fruits to cereals and poultry, dangerous for human consumption but also pollute groundwater. Organic food festivals and a petition drive are just the beginning of this campaign which will, hopefully, help the consumer understand the safety and politics of food.